It was built more than 2,000 years ago, in the coastal area of Peru and only 400 kms. from Lima located near Casma. 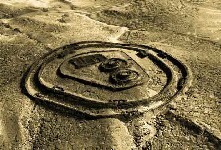 The archaeological place dates III Century B.C. (Final Formative period). It consists of several circular structures fortified with thick stone walls and plastered with mud, besides 13 towers from which it was observed the movements of the Sun. The towers are located above a hill and in his surroundings, celebrations must of been made of important religious and political ceremonies during the solstices and the equinoxes, before the presence of thousands of pilgrims' that arrived every year. Before these investigations Chanquillo was considered a fortress with eminently military functions and it was related with the Mochica Culture of the First Regional Development (200-600. C.). Day 01.- Departure from Lima towards the north arriving to Casma. Overnight. Day 02.- Visit to the archaeological site of Sechin and Chanquillo. Return to Casma. Overnight. Day 03.- Departure back to Lima. NOTE: You can continue to Huaraz or Chimbote to go towards Trujillo. (this is on your own). For further information of the program, reservations or rates, contact us. We gladly accept Credit Cards On Line Reservations through PayPal. Reservations can be made at our office with a few days in advance of our programs (except Machu Picchu Inca Trail 6 months). The personalized experiential tours require 3 Days in advance to the date of departure with exception of Caral that can be done the day before, previous confirmation. We do not accept Credit Cards. All the reservations that are received with more than 30 days in advance (however 8-12 weeks in advance is recommended especially during the months of May, June, July and August) to the date of departure to any trip, it will be confirmed by email and it will be needed to have the total payment 30 days, (Machu Picchu Inca Trail 6 months) before the date of departure of the tour or trek. We gladly accept Credit Cards through PayPal. In order to see our dates that we are available or set date trips, please check our Calendar. THANK YOU FOR VISITING MY PAGE AT ANGELFIRE, PLEASE COME BACK AGAIN.